Everybody is different, and everybody loves using different tools. For hyperhydrosis treatments we recommend a surgical pen for marking out the underarms. Although a white pencil is the ideal tool, it rarely works well as you need a dry surface, warm skin and enough pencil sharpened to mark out, but not too much so that it breaks off. The surgical pens overcomes all of those issues. 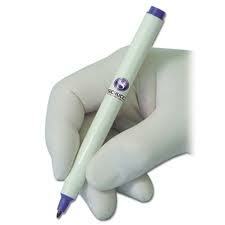 Our second tip of course with this would be not to inject through the marked pen so you don’t tattoo the skin.